Guys, I’m so excited today is WEDNESDAY! 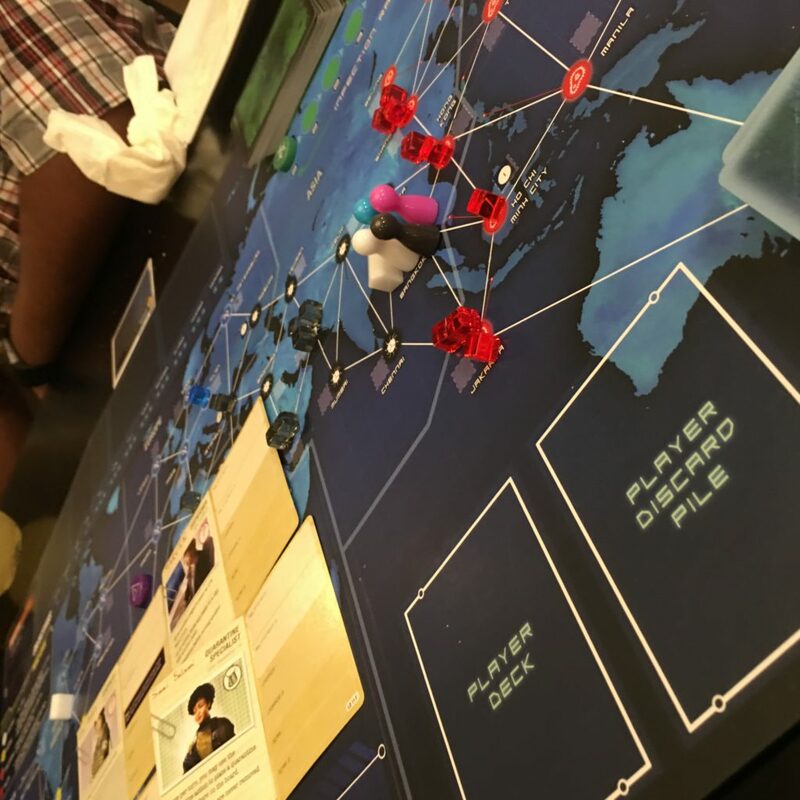 Every other week, a group of us get together to play Pandemic Legacy. It’s a game about curing diseases and basically saving the world. I know you’re here for the recipe, but Wednesdays I usually talk about whatever is going on in my life, and I there is just no way I can get away without talking about the game. I’m not joking. I think this might be my very favorite game. Ever. Each time you play the game, the board changes and things are either taken away or added. There’s a lot of unknown about the story and it’s slowly being revealed over time. It’s also incredibly intense. So good. I found a picture of the board when we first started playing to show you guys so I wouldn’t spoil secrets. If you love games I really recommend Pandemic Legacy. 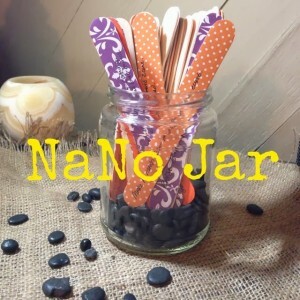 It’s also a great gift to give for the Holidays. I’m sure I’ll be writing more about it in the future, and I’ll let you know how I feel later on. We’re only on April (you play a month each time you play–January-December), so we’re still pretty early on. I’ll keep you updated! My mom makes the best stuffing. 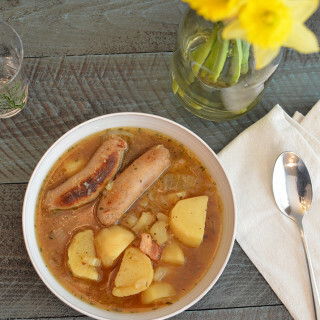 It was filled with bread cubes, all kinds of veggies, and most importantly—sausage. I just loved the little chunks of sausage. I think she started adding more sausage into the dish because I would end up picking it out before it was ready to be served. Ultimately, that just led to me eating more sausage pieces. Stuffing is such a comfort food, and if you aren’t eating breads or gluten, this can bring a tear to your eye. I wanted to make something that felt similar to stuffing, something hearty, warm, and with multiple flavors from a variety of ingredients. I also needed to be able to have sausage in it, whatever it ended up being. 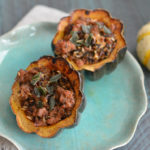 Why not stuffed acorn squash?! Bingo. 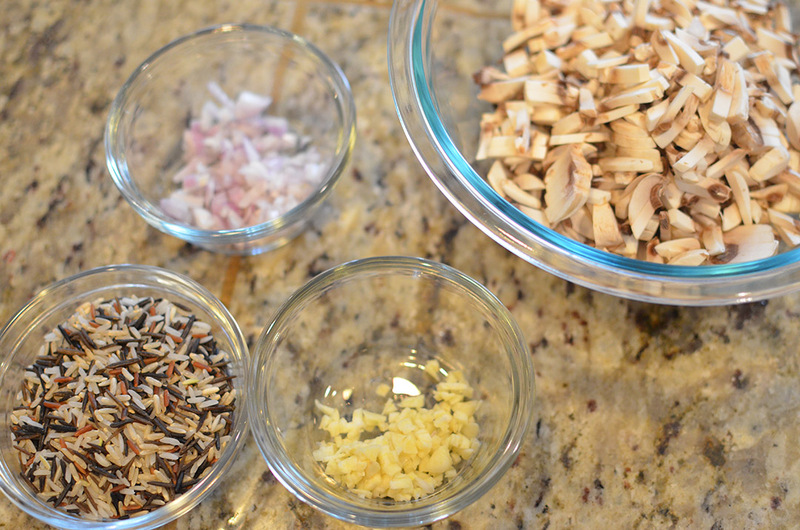 Prepare your shallots, mushrooms, wild rice, and garlic. 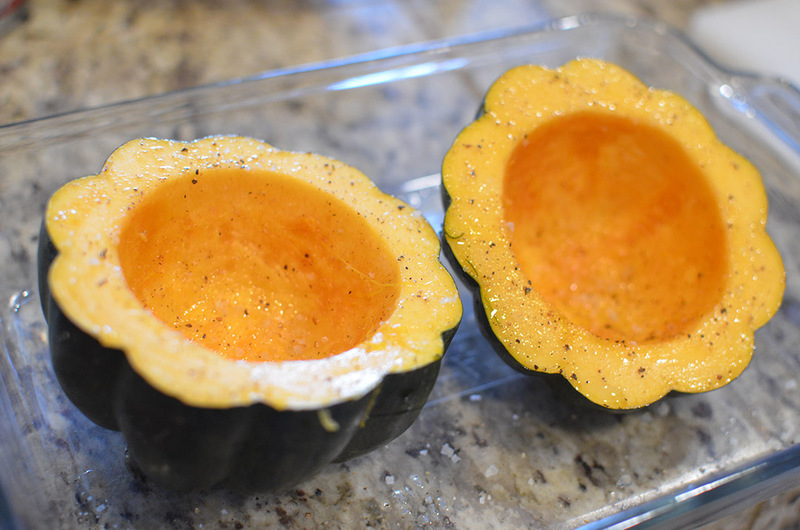 Cut the acorn squash in half and drizzle it with oil. Season with salt and pepper. 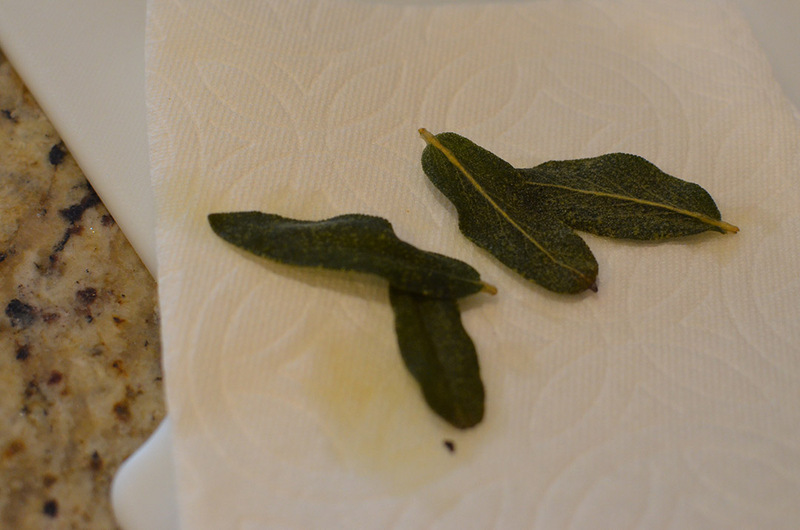 In a pan, add some olive oil and fry your sage leaves until they’re nice and crispy. They should be able to crumble when done. Put them on a towel to absorb excess grease. In the same oil, sauté the garlic and shallots for 1-2 minutes. Add the rice and cook for another minute. Finally, add the chicken broth and cover for about 30 minutes. Wild rice is a bit tricky. If it is still too hard after 30 minutes, add more chicken broth and cook for a bit longer. Cook the sausage until there is no pink. Combine it with the rice mixture, then scoop the mix into the acorn squash and bake for 20 minutes. Serve hot! 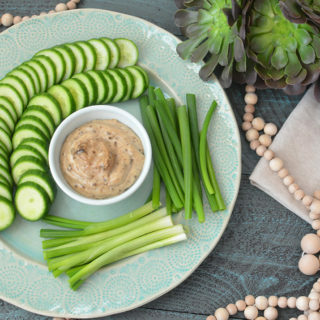 An incredibly tasty and gluten free alternative to stuffing! – On a baking sheet, place the two halves of the acorn squash on a baking mat or foil, cut side up. Drizzle with olive oil and season with salt and pepper. 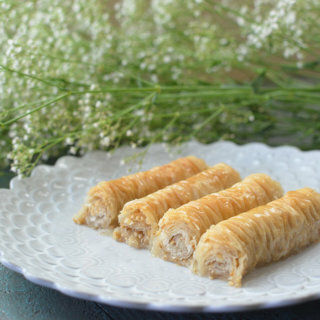 – Place into oven and bake for 50 minutes. – While squash is baking, pour 2 TB of olive oil in a deep dish skillet and warm up on medium heat. 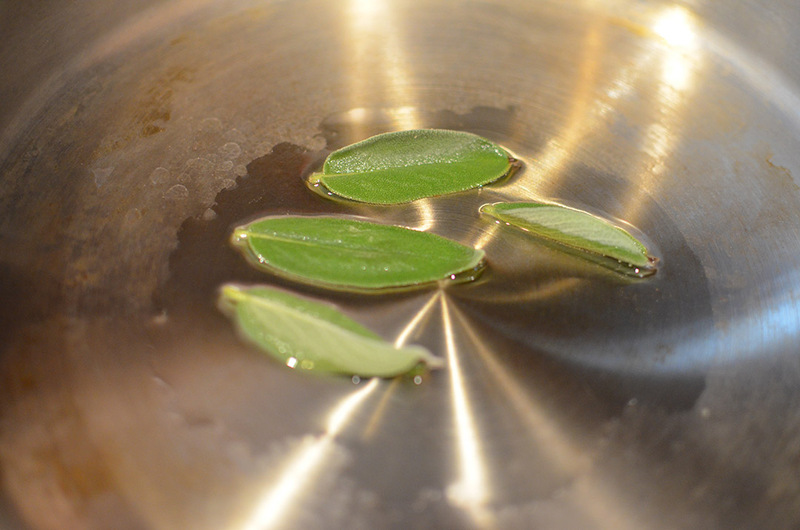 When oil is heated, place the four sage leaves into the oil. Let the leaves crisp and turn over to crisp the other side. – When the sage leaves are crispy, remove and place on a towel to remove excess oil. Set aside. 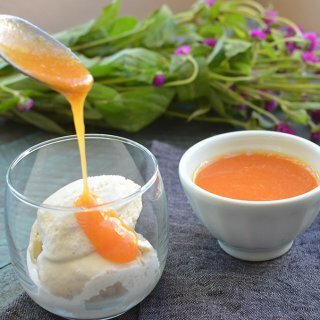 – In the sage infused oil, add the garlic and shallot and sauté for one minute. 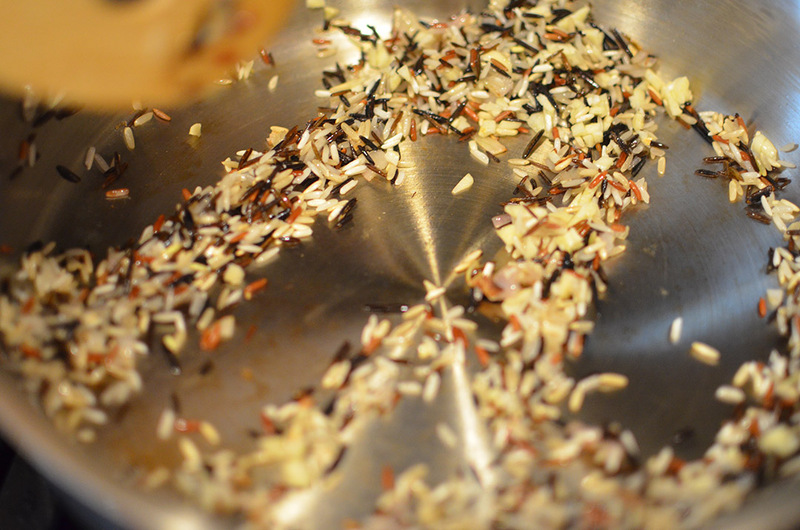 – Add the uncooked wild rice and sauté for another minute. – Add the chicken broth to the skillet, stir, cover, and reduce heat to low. Cook for about 30 minutes or until rice has plumped up and has absorbed the broth. *Wild rice can be tricky. Depending on your wild rice, you may need a little more chicken broth. If after 30 minutes you no longer have broth and the rice is still hard, add a little more broth and let it continue to cook. – While the rice is cooking, in another pan, cook the sweet Italian sausage till there is no pink. Drain grease from pan. 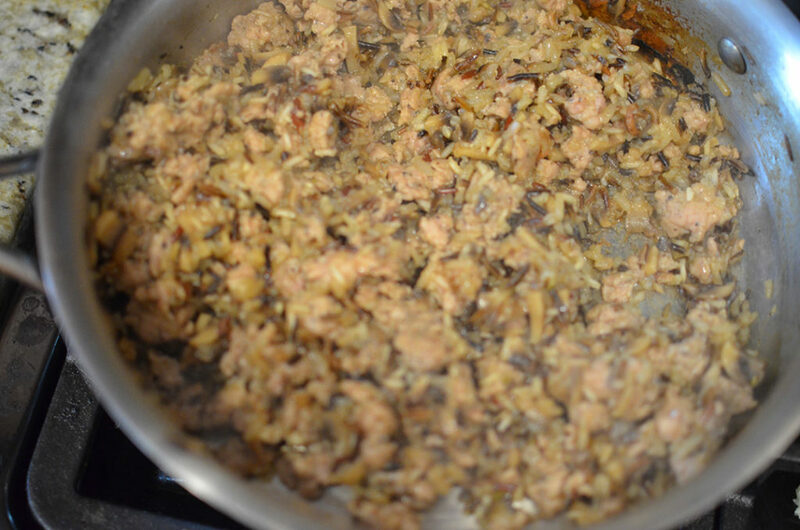 – Add the mushrooms to the sausage and cook until tender. – When the rice is finished, combine with sausage and mushrooms. Mix well. – Scoop mixture into baked acorn squash halves. Return to oven and bake for another 20 minutes. 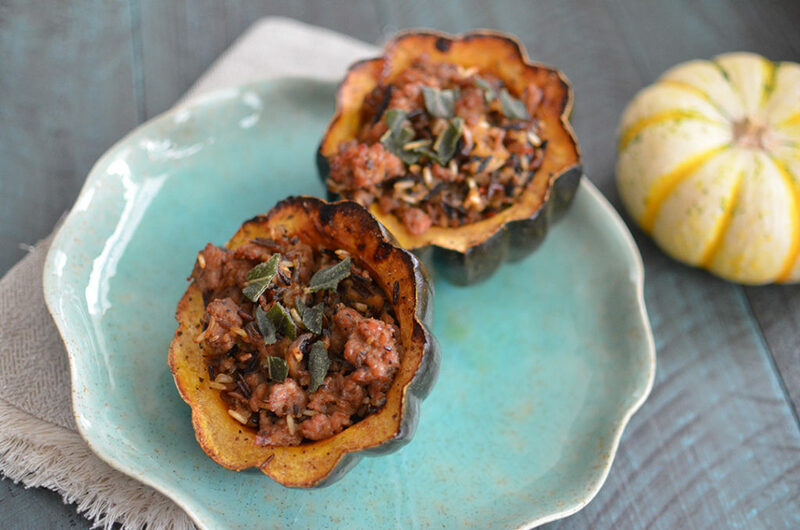 – Crumble the sage leaves onto the stuffed squash right before serving.